If your internet service provider limits your broadband, SurplusMeter is useful tool to monitor your levels and make sure you never go over. The program offers a clear interface window, from which you can set the type of connection you have, download limit in bytes and month you want to start the analysis on. The bottom part of the application serves to show all the stats that SurplusMeter is catching like megabytes left, accumulated surplus, daily usage or days left in month. Thanks to three progress bar, you also have a representation of days left, megabytes downloaded and uploads and downloads. If you go into the preferences menu you'll be able to even add or remove bytes, to make sure you're monitoring the correct amount of bandwidth. You can also decide to clear stats completely and start from zero by clicking reset. This is quite useful after a while, as it can get confusing as to how much bandwidth you've been using. SurplusMeter is a useful tool to monitor all stats on your broadband bandwidth usage. 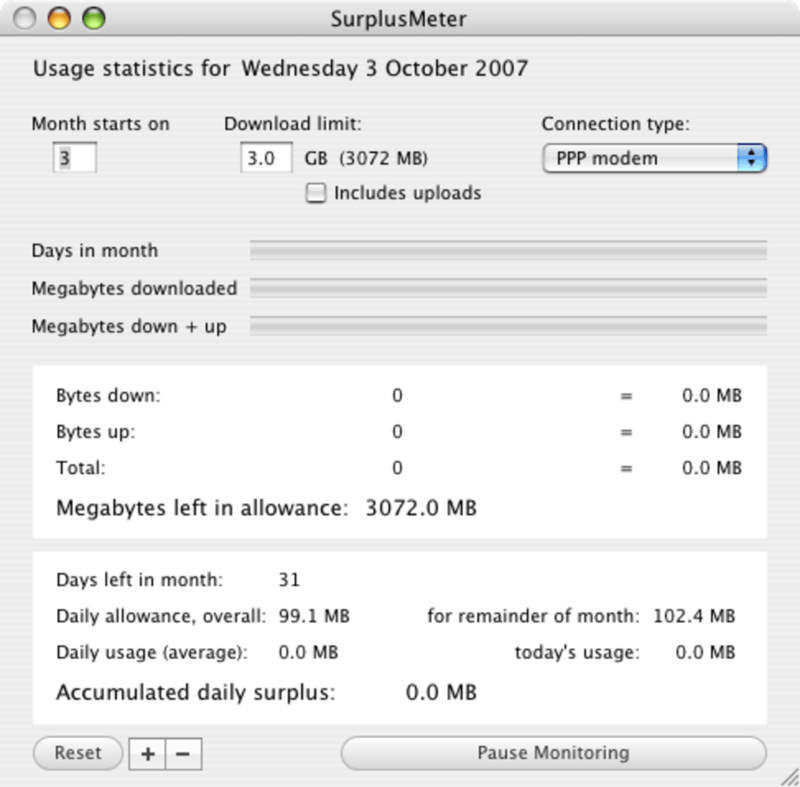 If you have a broadband internet service with a monthly download limit, you may find SurplusMeter comes in handy. It measures the download and upload traffic on your Internet connection and keeps a record of your traffic volume. It gives you all kinds of useful output statistics, like daily allowance, average daily usage, accumulated surplus, and more. Statistics are presented in three ways: simple bytes in/out; summaries of megabytes used and remaining, and graphic meters which display at a glance when you're getting close to exceeding your limit. What do you think about SurplusMeter? Do you recommend it? Why?